Quito and Guayaquil are Ecuador's primary cities offering many opportunities to learn more about the country's unique culture and history. On a Quito City Tour you can visit famous churches and plazas in the well conserved colonial district. Guayaquil City Tours present colorful introductions to the fast paced and bold metropolis. Our Destination Experts have provided a great combination of city tours for you to choose from below. Contact us for more information! Quito, or by proper name, San Francisco de Quito, is the capital city of Ecuador and is the highest capital city in the world. As a World Heritage Site, it is the best preserved historic and colonial city of all Latin America. When entering the colonial sector of the city, walk back in time along the cobblestoned streets and admire the beautifully preserved plazas and squares, not to mention the amazing architectural feats of some of the most stunning churches and basilicas in South America. Guayaquil, also known as Santiago de Guayaquil, is Ecuador's largest and most populous city in the country. Sitting on the coast as a major port, Guayaquil is becoming known as a first class international destination and business district. There are many parks, piers and architectural places of importance such as the Malecón 2000, and beautiful pier that is symbolic to the city, El Parque de Las Iguanas where hundreds of iguanas have made their home, and Parque Centenario with beautiful trees arching over walkways and statues of importance offering memorial to many battles fought to win Ecuador's Independence. 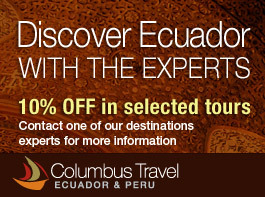 See more tours our Columbus Travel Destination Experts have designed with you in mind: Andean Short Trips, Peru Tours, and Ecuador Expeditions.